Taylor had been bidding to win a 17th World Championship title to end the sport’s most successful career in a blaze of glory as he prepares to move into retirement. However, Cross produced a display reminiscent of Taylor himself when he had broken through to win the 1990 World Championship with a 6-1 rout of mentor Eric Bristow as the 27-year-old completed his remarkable rise by claiming the biggest title in darts. Cross watched last year’s World Championship final at home as he prepared to join the PDC circuit full-time, but lifted the Sid Waddell Trophy and secured the £400,000 first prize – double his career earnings to date – with an incredible display. The former electrician won the first three sets without reply, taking out 167 to win the second and 153 to claim the third as he took nine of the opening 11 legs. 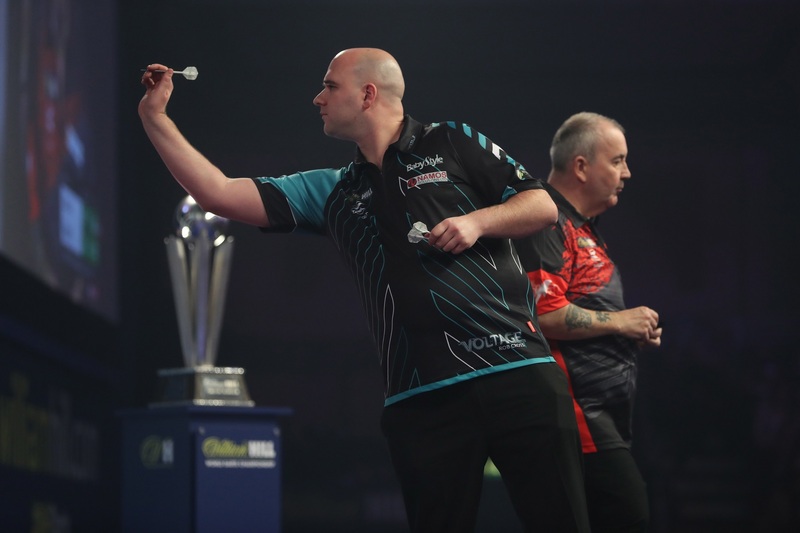 Taylor hit back in the fourth with three successive legs, and then missed double 12 for a nine-darter in the opening leg of set five – only to see Cross take that leg and the set to restore his advantage. 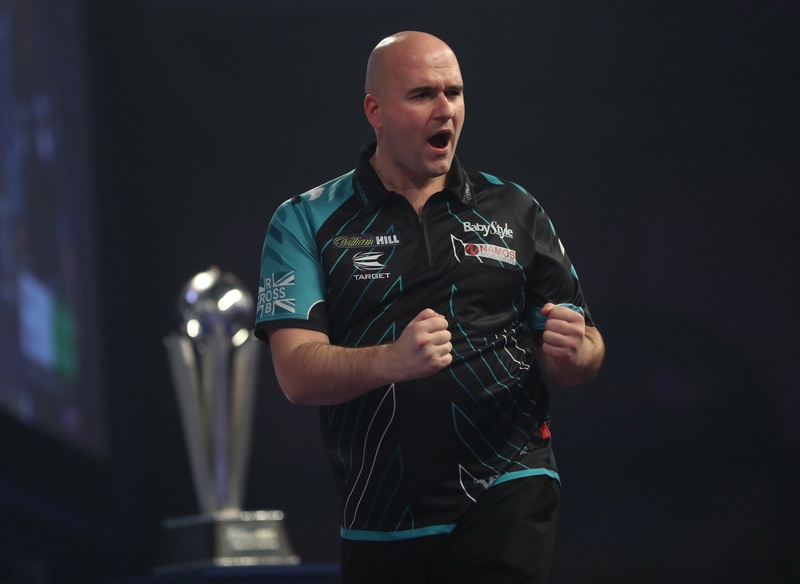 He then took the next two sets by a 3-1 scoreline to move 6-1 up as he maintained an average of 107, and though Taylor won the eighth without reply to claim his second set, Cross would not be denied as he won set nine with a 140 checkout to secure the title. Only two players have averaged more than Cross’ 107.67 in the World Championship final, while he added another 11 maximums and a 60 percent checkout rate as he won 21 legs to Taylor’s ten. 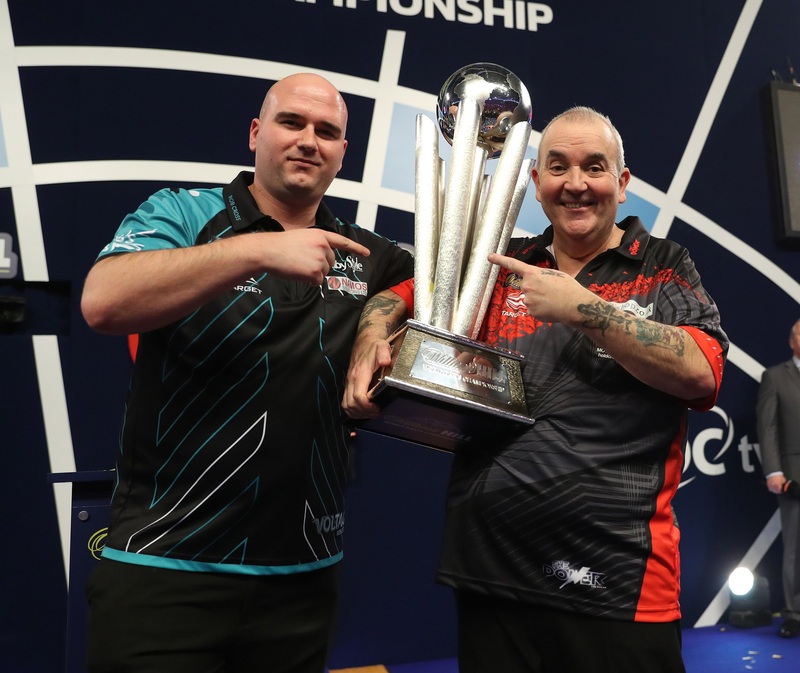 As Cross lifted what could be the first of many World Championship titles, he was keen to share his moment with the retiring Taylor as the pair lifted the Sid Waddell Trophy in front of the capacity Alexandra Palace crowd. “I feel great, but I’ve got to say it’s Phil’s last year – I’ve won my first World Championship but it’s about him departing and that’s why I let him lift the trophy with me,” said Cross. “He’s been phenomenal. It was my dream 15 years ago to play this guy and now I’ve played him. It’s absolute phenomenal. “In the final today it was a dream to play Phil. Watching him with his dominance over the years he has been excellent and you won’t see another sportsman like him. The significance of being born in the same year as Taylor’s demolition job on Bristow was not lost on Cross – who has continually been compared to the 57-year-old in his approach to the game. “I was born in 1990 so the coincidence may be there as he won his first World title while I took my first breath of air,” Cross added. 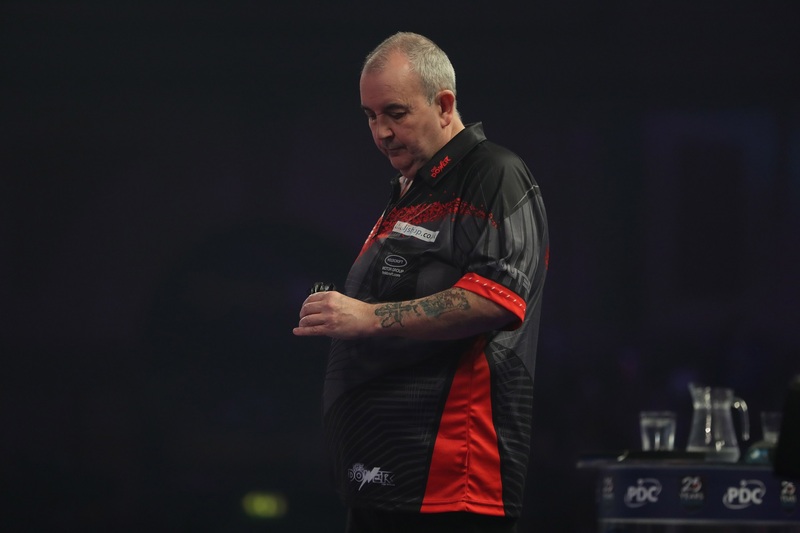 Although disappointed that he could not add to his 11 televised nine-darters with his first in the World Championship, Taylor insisted that his narrow miss on double 12 did not affect the outcome of the match. “It was close, I think the Paul Lim one would have been better, but it didn’t go in and it didn’t matter really,” said Taylor, referring to Lim’s miss at double 12 earlier in the event. Taylor once again says that there are striking similarities between new World Champion Cross and himself in the way they both play darts. “I tried my best, I just didn’t have that push against him,” added Taylor. “He was like me 25 years ago. 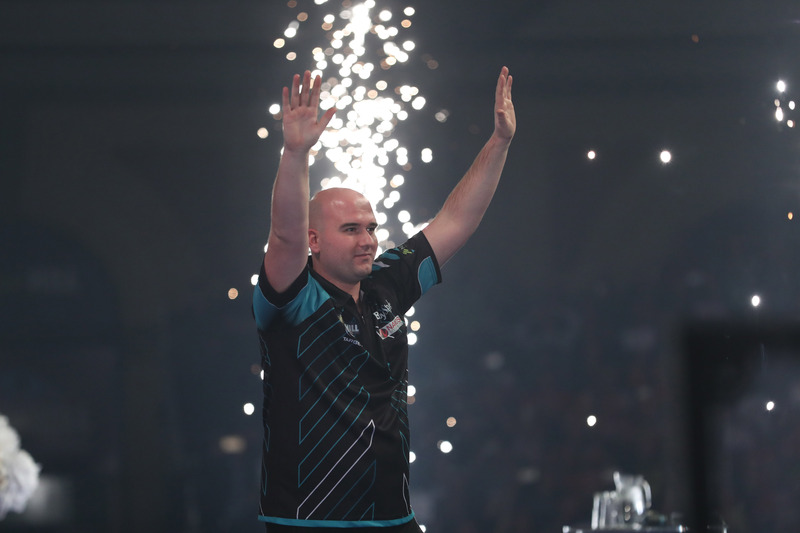 The £400,000 prize money which Cross took as champion means that he has risen to third on the PDC Order of Merit, incredibly achieving the feat inside 12 months on a two-year ranking list. Cross will also now make his Unibet Premier League debut in February after being included as one of four debutants – alongside Daryl Gurney, Mensur Suljovic and Gerwyn Price – for the tournament. 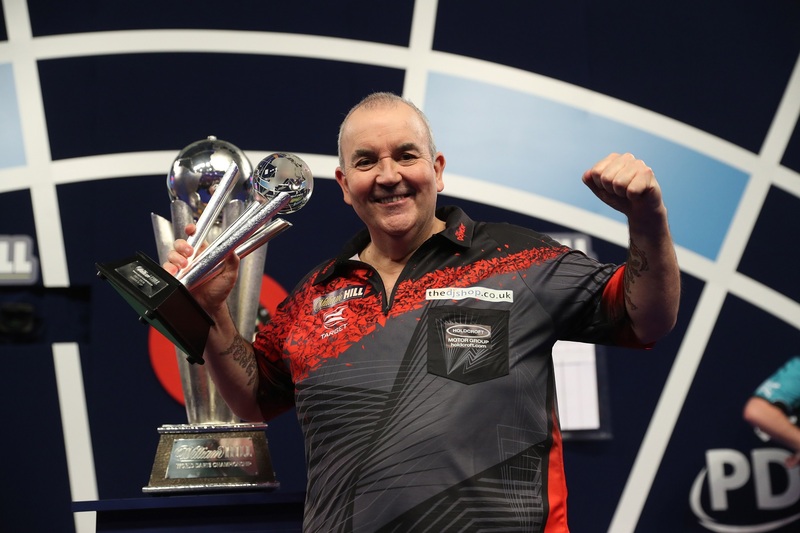 Taylor, meanwhile, has seen his retirement marked by the PDC with the renaming of the BetVictor World Matchplay trophy as “The Phil Taylor Trophy” from 2018 onwards, making his amazing 16 Blackpool triumphs. 1-0 – Cross holds throw with a solid 84 outshot on a 14-dart leg to start the final. 1-1 – Taylor responds with a 14-darter of his own as Cross suffers two bounce outs. 2-1 – Cross hits TWO 180s in the leg as he takes it in just 12 darts. 3-1 – Taylor hits a 180 but misses two doubles allowing Cross to pinch a break for the set. 1-0 – A 180 for Cross helps him to a second successive break of the Taylor throw. 2-0 – A tidy 68 checkout from Cross doubles his advantage in the set. 2-1 – A second 180 of the match and tops finish gets Taylor on the board. 3-1 – Special darts from Cross as he takes out 167 on the bull for the set. 1-0 – No let up from Cross as he hits another maximum to kick off with a hold. 2-0 – A fifth 180 of the match and an 11-darter from Cross for a break. 3-0 – Astonishing darts from Cross as he takes out 153 for the set. 0-1 – Cross hits a 180 but Taylor takes out 151 – vintage Taylor but it’s all just to hold throw. 0-2 – Taylor backs up that amazing finish with a 14-dart break of throw. 0-3 – Third straight leg for Taylor as he cleans up 80 to get a set on the board. 1-0 – Incredible! Taylor just misses double 12 for a NINE-DARTER, but then loses the leg as he misses three further darts at doubles before Cross takes out 83. 2-0 – Cross now backs up that leg with an 11-darter to break. 3-0 – Just a standard 14-darter for Cross, with an eighth 180 thrown in. 1-0 – Relentless Cross hits a 180 and another 11-darter to start the set. 2-0 – Yet another maximum for Cross and this time a 13-dart leg. 2-1 – Taylor hits a 80 of his own and a 123 finish to hold throw. 3-1 – This time it’s 14 darts for Cross who takes out 84 for the set. 1-0 – Cross hasn’t missed double 18 yet – he nails it again to take out 56 and a 13-darter. 1-1 – A 13-darter from Taylor with a 180 but yet again on his own throw. 2-1 – An 11th 180 for Cross helps him go ahead. 3-1 – Taylor lands a 180, but misses the bull for a 161 finish as Cross steps in to take out 93 for a 12-darter to move a set away from the title. 0-1 – Cross actually misses a couple of doubles for once – Taylor doesn’t as he lands double 16. 0-2 – A 180 and a 12-darter for Taylor in a rare break of the Cross throw. 0-3 – Another two missed doubles from Cross as Taylor takes the set. 1-0 – 13 darts is all it takes for Cross to go ahead as he seeks to close out the win. 2-0 – Cross lands a 177 as he completes back-to-back 13 darters, despite a Taylor 180. 3-0 – He’s done it! An amazing finish as Cross takes out 140 to win it in style – incredible darts as he scores 59, 140, 162 and then checks out 140 for the title!